First of all, I thought these cords would be beautiful together. One is red shot through with a little metallic gold thread. The other is a light gold with just a little sheen. I was wrong. The light gold looks sand or camel colored in the twist. 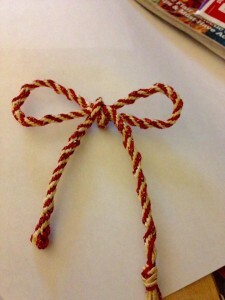 Because the red is unevenly woven, the cord is, too. 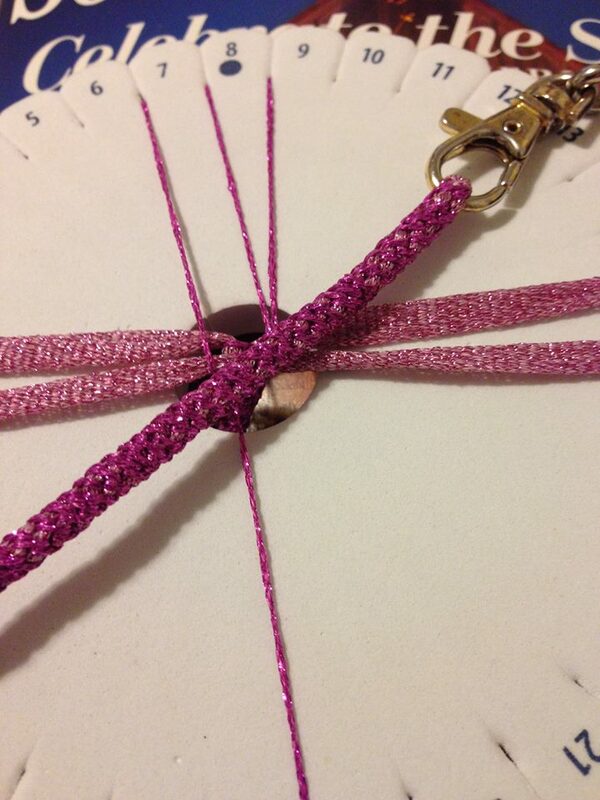 I had hoped to make a bracelet out of it, but it looks like it’s fated for a gift tie. On the other hand, these yarns made a beautiful cord. Here’s what I learned from this one: It’s an 8 strand cord of course, using 4 thick and 4 thin, placed perpendicularly to each other. 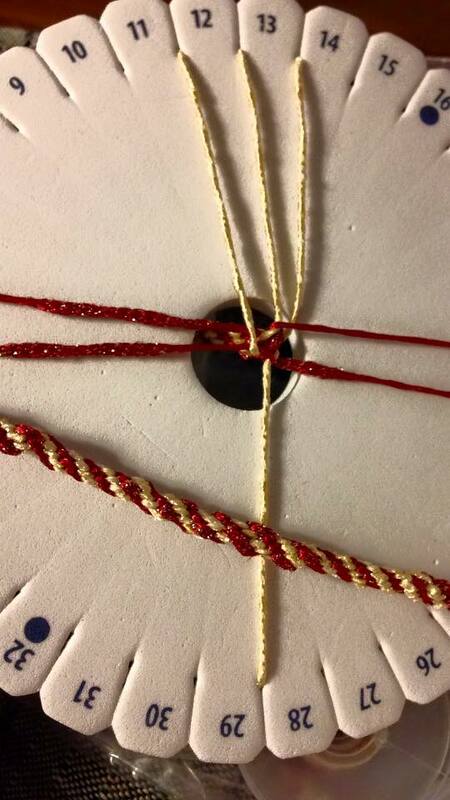 (+) I began braiding with the thin cords and so they wrapped themselves around the thick ones. I started with 9 feet of each, but quickly used up the thin cords. Next time, the thin cords need to be at least 2 feet longer than the thick. The resulting cord is beautiful, but all the metal content makes it scratchy. I won’t be using it in jewelry, either. 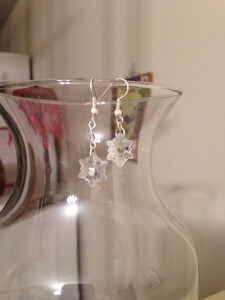 I made bell flowers for spring and clear crystals and snowflakes for right now! We had a dusting of snow yesterday afternoon, and are expecting a truckload this weekend! 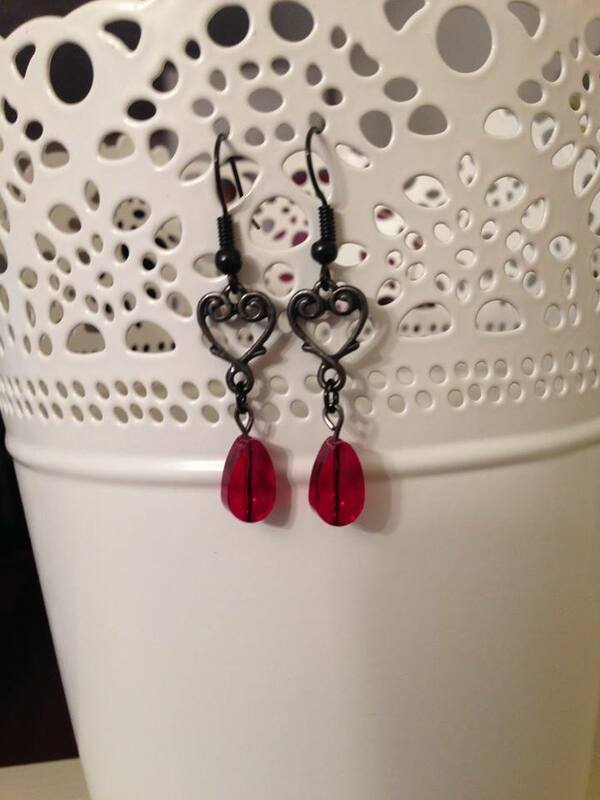 Valentines for vampires? 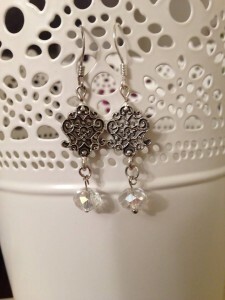 Before I price these, I’ve got to look back and see what I paid for those Swarovski crystals. 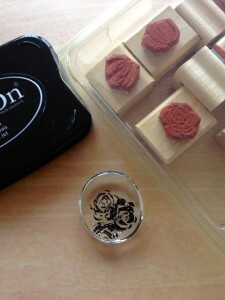 I bought tiny rubber stamps (used, on eBay,) and a pad of permanent ink. 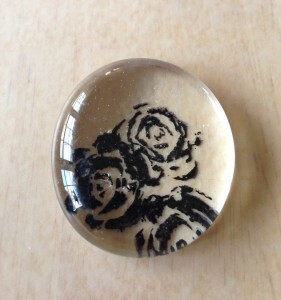 I stamped these tiny roses on the back of one of my glass gems. I was inspired by a rectangular piece I saw on Pinterest. 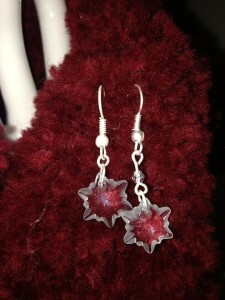 The inspiration piece used alcohol inks, but the accompanying article also mentioned using Stickles glitter glue. 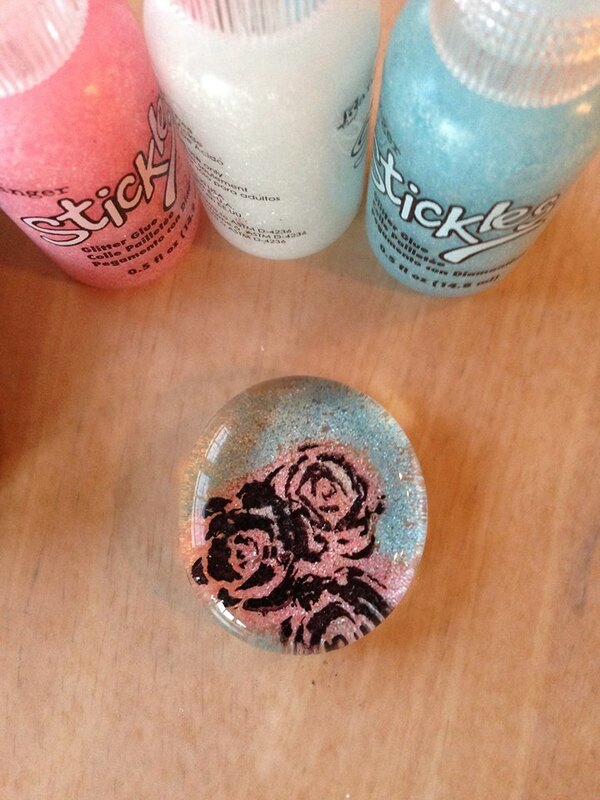 I don’t have alcohol inks, (yet,) but I did buy this 3 pack of Stickles on clearance at Michael’s a couple of weeks ago. Since baby blue AND pink are the 2016 colors of the year, I thought it a wise investment. I think I would’ve liked the gem better in all white. It needs some touch up, too. 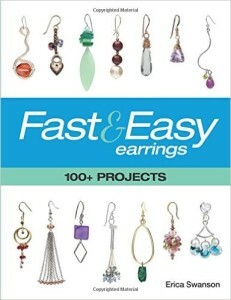 Do I need an “Easy Earwire Maker?” They are selling them on JTV right now. Nope. Too many other bills in January. I added it to my wishlist. 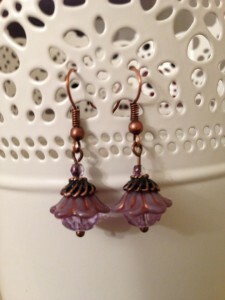 I also like the gold and silver plated earwires with the ball end that I’ve been using. 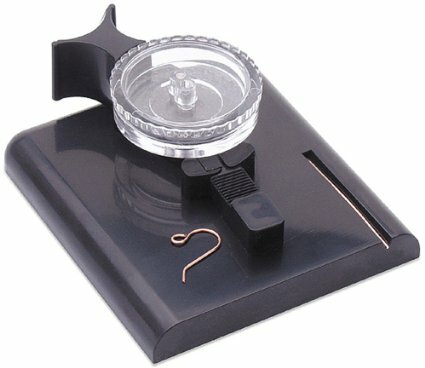 Wonder if I could use ball end headpins to make them with this gadget? Hmmmn. I also want this book: It’s already on my wishlist! 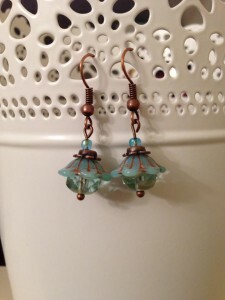 Filed under jewelry and tagged books, tools, wishlist |	Comments Off on Easy Earwire Maker? It’s just flurries, but after all our warm weather, what a surprise!!! I bought this image from Graphic Stock. 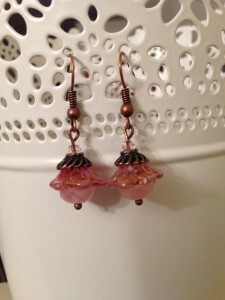 I think it will make beautiful glass gem pendants! 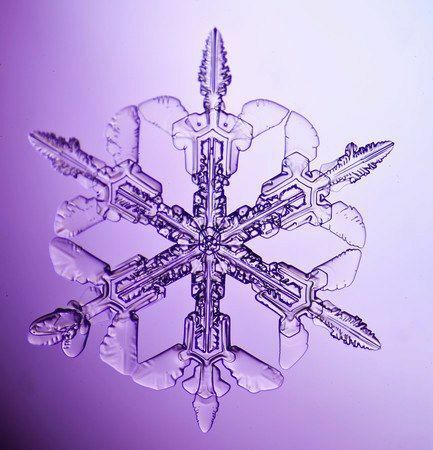 Filed under Uncategorized and tagged images, snowflakes |	Comments Off on Snowflakes, today!